A code is a set of rules or terms that are available in written as well as unwritten format. Similarly, dress code is a code regarding the clothing and physical appearance of a person according to the given situation. Clothing may vary person to person depending on the social status, authority and significance of the person, and the circumstances. Within 24 hours, a person changes his or her clothing, at least twice. Workplace and home both the places call for different dress codes to provide uniformity and comfort respectively. This comfort and uniformity is a result of adaptation of people of different culture, religion, and region. Dress code at work and acceptance of certain style depends upon the society however, the western form of clothing is ‘mostly’ (mostly and not entirely) accepted in all sectors nowadays. In the similar manner, dress-coding system also knocked on the doors of the workplace in the 1950s period. Through the years, the workplace dress codes have experienced innumerable changes. In corporation, men are required to wear clean, business clothes that might include shirt and trousers. In the law and banking firms, employees (lawyers and bankers) are expected to wear suits, neckties, and other formal outfits. However today, the changes over the years have resulted in a variety of appropriate dress codes for both men and women. Let us first talk about some workplace dress code policies. The workplace dress codes are not just any code. They portray the atmosphere and culture of that organization. 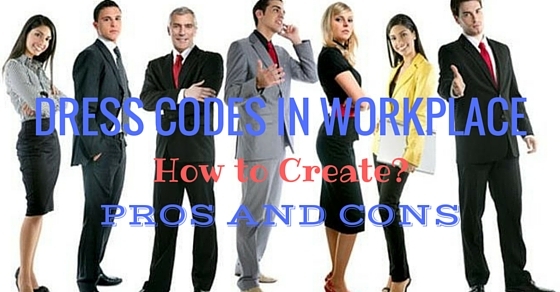 Moreover, the code indirectly (non-verbal) tells you about the standards and expectation of the employer. Thus, for an employer, it is very important to write down a specific set of guidelines in the form of a policy for the employees. This helps in rectifying any inappropriate clothing of the employee in the workplace. How to Create a Dress Code Policy? As an employer, you always want your firm and employees to maintain the standard of your organization. Thus, it is vital to identify and set down your expectations. However, before laying down your expectations, consider the level of comfort for your employees and the clients. If you have rich clients visiting your firm on a regular basis then you might want your staff to look perfectly professional. Thus, consider your work culture. Rules are made to break however, if you let your employees know about the possible accidents that might occur on violating the dress code. For example, your firm is an industry that produces a food item. People working manually or through the machine in your industry need to tie their hair properly, wear gloves, and appropriate fit clothes. Thus, when you mention these in your expected dress code, give them a reason to follow. Loose hair may fall into the food item and degrade the quality and trust of your consumer. Moreover, loose clothing or fancy accessories may be stuck into some machine and cause machine failure or accidents. Expected standards are not based out of blue. The first step in creating a policy is that you understand the required standard yourself. However, it is equally important for your employees to know the standards too. Thus, when you jot down the standards make sure to get your facts and ideologies through the other end of the table. Once they are aware of your standards and expectation, they will make sure that they do not let you down (hopefully). That is what ideal employees do. Have you ever observed children? If you have, then you must have surely noticed that they ignore the things they are asked to do. Well, if you prefer business casual dress code then telling them what they are not supposed to wear is also important. Let them know the clothing that is prohibited in your firm. For example, clothing that shows stomach, cleavage, back, etc are unacceptable in professional platform. Slang printed t-shirts, torn jeans; wrinkled clothes, etc are also inappropriate. Thus, list down the dos’ and don’ts. What do you mean by grooming? What tips would you like to give to your employees? Would those tips maintain the standards of your organization? Well, once you have the answers to your above question then lay them down in your dress code policy. You can give tips to the females like toning down on make-up and avoiding glittery strokes. Similarly, for men you can advice on avoiding funky accessories like huge rings, etc. Moreover, do not forget the odor problem and try to target it in the policy too. Ask them to make sure to stick with professionalism of the workplace. Why would they follow the rules? What might happen if they decide to be a bit rebellious? They need to know the consequences that accompany the rebellious attitude in your firm. The policy should cover the punishments relating to the rebellious attitude. For example, when the employee breaks the rule for first time, he or she is subject to a warning. However, do not forget to hear his part of the story too before deciding on an action. Moreover, if the same mistake is repeated without any valid reason then apply some strict punishments like suspension or fine. This is an essential step in making a policy. You may create a policy according to the way you want, however, make sure to check and proofread it as soon as it is completed. Your policy may take your company down if it is subject to any racial, cast, color, creed or gender discrimination. Avoid being a part of such issues or they may seriously destroy your reputation. Now that you have the perfect policy, let us look at the advantages of implementing it in your workplace. A workplace has a diverse range of employees, whose opinion and choices may vary. Thus, the following advantages may not apply uniformly. Clarifying the expectations of the employer is very important. This helps the employees to stick to the standards of the organization. Moreover, it eliminates the possible confusion and dissimilarity between two employees of the same group. For example, if your company is a bit casual but you want it to look professional; your guidelines of the dress code will make it possible for you. Moreover, it creates a sense of seriousness towards the work, which casual clothes can never do. Apart from maintaining the standards, dress codes play another inevitable role in the office. They unite everyone regardless of the position (in the company as well as the background). This feeling of unison motivates and encourages the employees to work with more dedication. Moreover, it throws away the procrastinating feelings. As a result, it maintains an active and professional environment in the workplace. An industry that produces or makes items requires certain guidance regarding the dress code, keeping in mind the safety of the employees. This is one of the objectives of the policy. For example, in a food factory, gloves are mandatory as they protect the quality of the production by reducing germs through hands. This ensures safety of the employees as well as the consumer. Moreover, prohibited dresses are also based on the very objective of safety (of women). Less revealing attire, decrease the odds of possible harassment or seduction. It is a common thing for all of us to think for a good few minutes (hours for some) before deciding on a dress. Similarly, although some employees may protest against the dress code, however, it saves the time of the employees on a whole. Moreover, they do not have to think about whether they look excessively casual or excessively formal, as they are just following the dress code. It is better to be on the safer side than to take any risk. It is quite possible that careless clothing will call onto accidents. However, if you already have a dress code then there is no place for any lawsuits. Even if the lawsuit is filed, the result will be in the favor of the company. Being less active or laid back towards work can put the career at stake. However, new employees or recent graduate may not understand the deficit of such clothing. Dress coding helps the employees to look professional. Moreover, it increases the productivity of the employee and the team spirit. Due to uniformity, employees are able to work with each other without having an inferiority complex (due to financial background). Having similar dress code may boost the confidence of the employees. For example, if you are the owner of the restaurant, you constantly interact with your customers. As a result, your employees need to look smart in front of the customers. They should look like they belong to the restaurant. Moreover, this creates a good impression in front of the customers too. Cons of anything are always accompanying the pros. Similarly, dress codes may have various advantages but the idea has certain drawbacks too. These limitations vary according to the culture of the workplace. Let us look at these shortcomings. Uniform at school made everyone feel equal. However, in the office making everyone wear the same type of clothes may turn the things boring for them. May be that is the reason colleges do not have any uniform. Moreover, it affects the work efficiency of the employees too. The most commonly faced problem by all employees is that not everyone can buy the required clothing (unless the company pays for the dress code). Moreover, a complicated dress code can consume most of the time in preparing. Dresses show the persona of the person. The ways you dress also shows the confidence and creativity of the employee. However, creating a dress code shuns down the creativity of the employees. Moreover, they lose the freedom to express their views and creativity. Dress code indirectly creates a barrier in productivity. As regardless of the promotion or position, they are stuck with the same dress code as their junior. Not everyone is comfortable with attire you chose. Discomfort may lead to problems such as lack of productivity, non-cooperation on the part of the employees, less efficiency in work, etc. These problems are mainly for those who are not accustomed to the formals. For example, your dress code includes suit, shirt-pant, tie, etc however, the employee is used to wearing business casual dresses or jeans then initially the change will bring discomfort for everyone. Thus, we can conclude that the pros of dress code policy may outnumber the cons of such. However, the matter is subjective enough and depends on upon the company culture and its types. Moreover, dress code policy should not favor any discrimination based on cast, color, and creed. In addition, the employer must keep in mind various issues such as the need, requirement, etc before creating an inclusive dress code policy that is acceptable on all grounds by the employees.